The Port Authority of New York and New Jersey advises that the eastbound/NY- bound Holland Tunnel will be have a traffic hold on Saturday night, August 20th, between 6:15 p.m. and 6:45 p.m. Motorists should use caution approaching tunnel during this time or consider alternate routes to avoid delays. The Port Authority of New York and New Jersey advises that the westbound/NJ- bound Holland Tunnel will be closed on Sunday morning, August 21st, from 1 a.m. until 8 a.m. to finish emergency repairs. All NJ-bound traffic will be diverted to the Lincoln Tunnel. In May a number of local schools came out to clean up the parks and have some fun. The Embankment school students picked up garbage in Enos Jones while children from the Scandinavian school picked up litter in Hamilton Park. The Garden Preschool students enjoyed a nature scavenger hunt. The HPNA wants to continue to encourage and support participation in caring for the parks by the local school children. Thank you students for making a difference! For the cost of $200, the Department of Public Works will plant a tree in an existing tree pit in front of your property, or create a new tree pit where regulations allow. The average cost of purchasing and planting a tree ranges from $750-$1200. By partnering with the Department of Public Works, you can reduce your tree planting costs while increasing the number of street trees throughout Jersey City. The benefits offered by trees are myriad and quantifiable; they reduce energy costs for property owners, increase property values, contribute to a cleaner environment, can reduce or prevent flooding and have actually been found to reduce stress levels. One word of advice from one of our board members: tree pits in front of old historic buildings may lead to water seeping thru to the basement of the building; speak with a professional before creating a new pit. 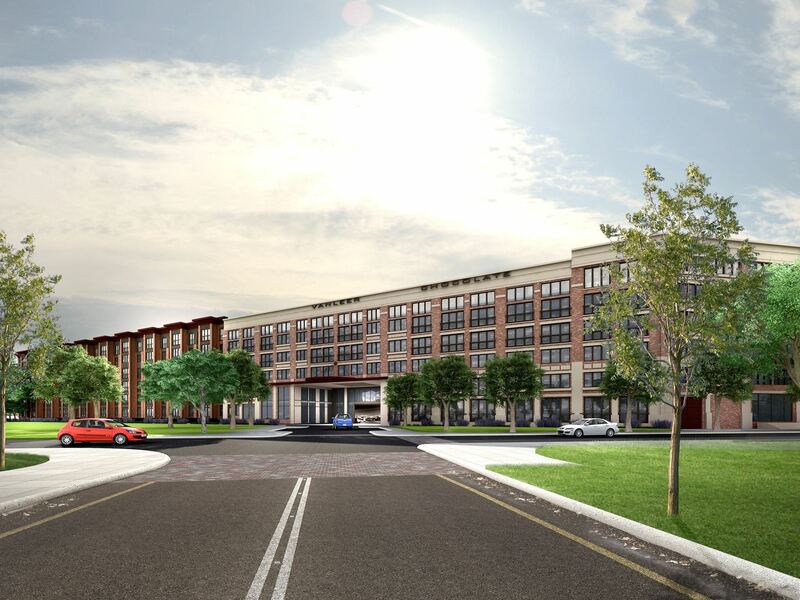 There's a lot of new development happening north of Hamilton Park and it falls under the Jersey Ave Park Redevelopment Plan. The Cast Iron Lofts have been built, the Soho Building is in progress, and 286-298 Coles Street along with the Van Leer project have initial site plan approval. 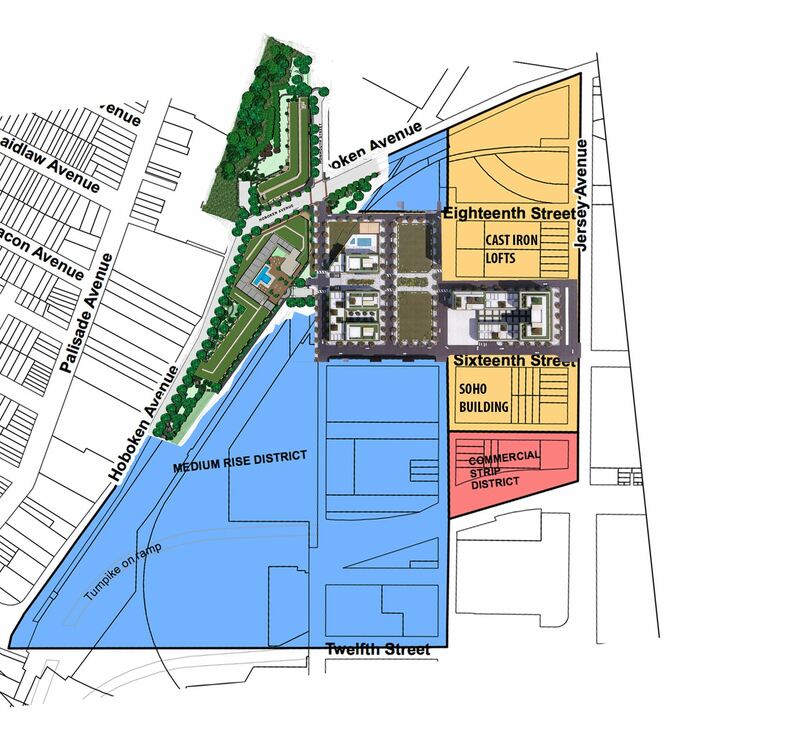 Below is an overhead of the latter 2 developments placed into the redevelopment plan map. All of the open space Hoboken Brownstone is incorporating into the project is very exciting! What's being planned for 286-298 Coles Street? Here's a breakdown of the units along with some initial renderings and the latest site plan. The developers will be asking for a variance to the current minimum unit size at the April 5th, 2016 planning board meeting. For instance the redevelopment plan states that the minimum studio size is 600 sq feet and the developer would like a variance to create studios that range from 450 sq ft to 650 sq ft. This site is approximately 5.5 acres and will contain a 2 acre public park. The site is currently approved for 873 units but with the addition of a lot and a variance request approval this would be bumped up to 1,181 units for this site. 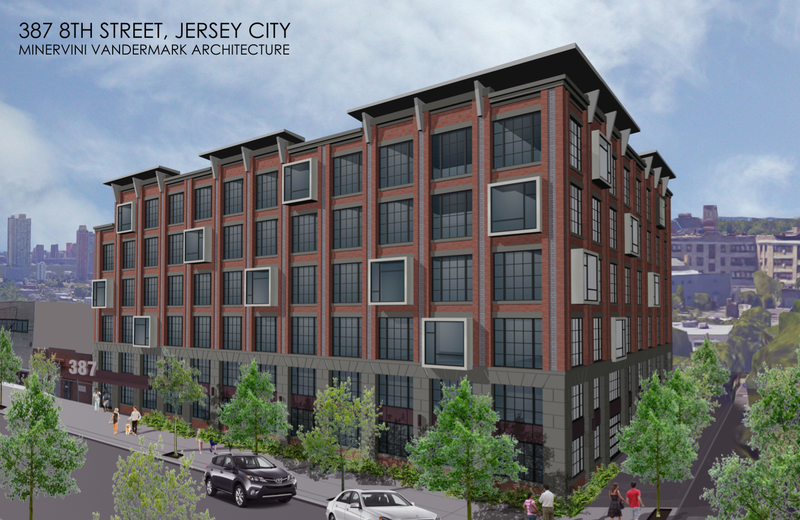 Both the Van Leer and 286-298 Coles street site are being developed by Hoboken Brownstone. The Van Leer site will have approximately 530 units and include a public playground. One odd thing about the way this redevelopment plan is being handled is that the maximum density allowed per acre is being calculated not just by using the acreage of the land the developer owns and will build on but also by allowing the developer to count the acreage to the middle of the streets surrounding the building. This in turn is bumping up the density allowed in this area. This plan has been adjusted since it was last presented to the HPNA. This plan was supposed to go before the planning board on April 5th but was withdrawn. Current specs for the building as discussed at the March 2nd HPNA meeting. There will be 1 parking spot per unit. This will be achieved via the addition of lifts. Tanya Marione from the Jersey City Planning Department has been working on a plan to change R1 zoning to R5 zoning in downtown JC. If you're wondering what zone you currently live in, see the map below. The necessity to fix the zoning is that the Village area is the last frontier of downtown and since not many developers come in and want to build 3 story houses, the zoning department is constantly being asked for variances for lots in R-1 zoning. 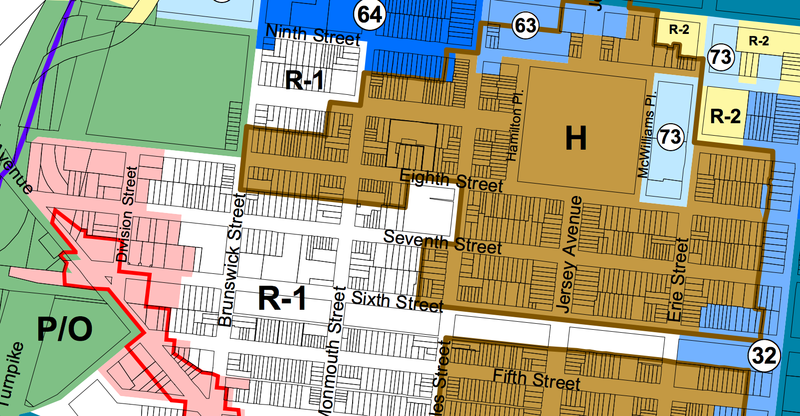 This R1 zoning also makes up a healthy portion of the Hamilton Park neighborhood which why the we've invited Tanya to our 3/2 meeting to discuss it. 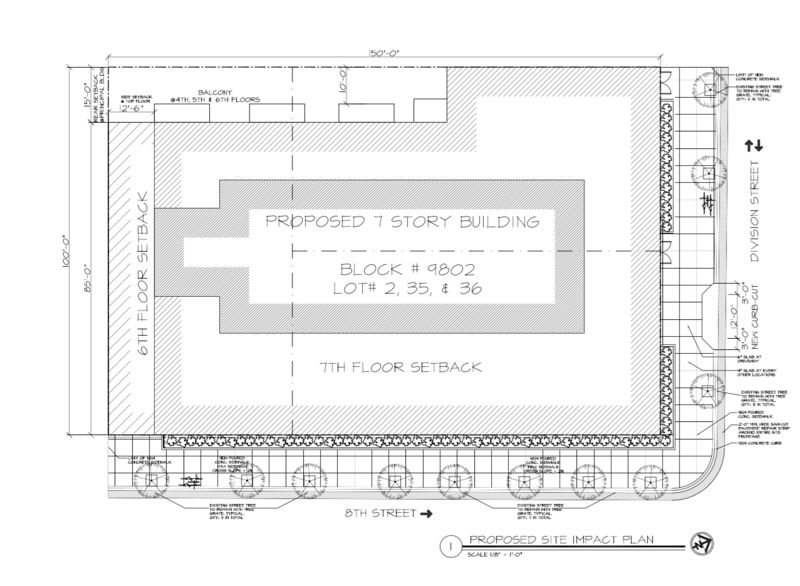 R1 zoning is one and two family housing with a max height of 3 stories and 1:1 parking. Tanya has worked on this for two years. Case law as early as the 1950s gives a lot of weight to the reconsideration and re-examination of existing zoning. For example, if the zoning board grants a bunch of the same use or height variances – they are abusing the point of variance relief, because they zone by ordinance/law and not by variance. Zoning by variance is essentially the wild west – there’s no master plan or common purpose. She has provided us with the annual report from the previous year. Including density and height analysis done for each block and lot within the R-1 district downtown along with a plethora of other data she has collected. As Tanya puts it, in the 1970s many areas, specifically downtown, were zoned as low density strictly residential. That was never the reality, and the new zoning, only to be solidified in 2000 with the new master plan – created buildings that are very out of character with the historic nature of the area. Three story buildings, with 2 families and a garage is the outlier, not the standard for R-1 downtown. The R-5 zoning matches the existing density of the current neighborhood but provides more square footage. It also has green infrastructure requirements built into it. 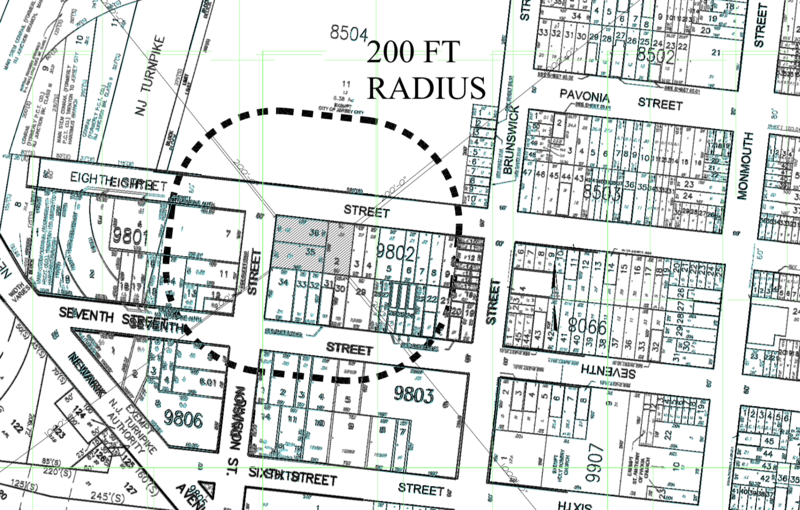 For some interesting background reference – the zoning from 1957, the one that would be most representative of what’s existing (except for maybe the more historic districts), was that the height was regulated by the width of the street. So the street front of your building could only be as high as the width and ½ of your street. Using that rule was partially how Tanya came about the 45 ft, because she went through and used google earth to measure street widths – even in the 30s and 50s, 45 ft would have been permitted. The law then specified that every ft after 45 ft had to be setback. This is a reminder that the Public Hearing for this ROZ modification is scheduled for February 23, 2016 at 5:30 p.m. in Council Chambers of City Hall. Per public input, two minor changes have been made to the Heights section of the map (attached) to remove one residential area along Palisade Avenue and add one commercial area along Central Avenue. No changes have been made to the downtown section of the map. In the interest of consistency, no further changes will be made to either map prior to the Board’s hearing. Newport Associates would like to lower the parking ratio to their next 10th Street embankment building (The Revetment Building). The redevelopment plan requires a 1 to 1 parking ratio. They are proposing 96 parking spots for the 163 units in the building. That's an on-site parking ratio of .58 per unit. Through a shuffling of parking spots Newport Associates would like the majority of the people in The Embankment Building to use a lot on the other side of 11th Street. The Revetment Building would then be allowed to rent parking spots in the The Embankment Building. By doing this, on paper, Newport Associates can say that the parking ratio is higher. 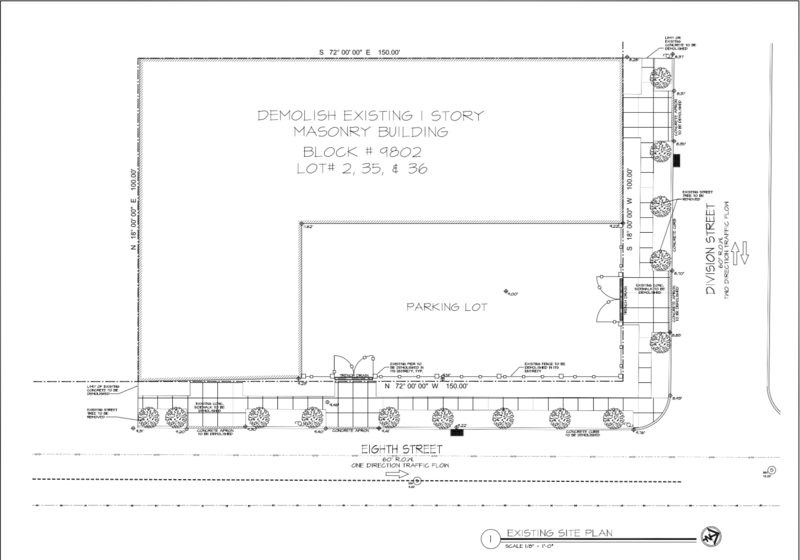 It wasn't too long ago that past HPNA board members worked with the city to solidify having 1 to 1 parking and items such as dog runs for these buildings. Newport Associates/LeFrak agreed to those items and they were placed into the redevelopment plan. This change will go before the planning board on 2/23. All are welcome to speak. Please check the homepage of our website for updates. You can also email your city representatives. Free youth (boys and girls k-8) lacrosse clinics at MS4 6:30 to 8pm on 2/10 and 2/17, and at PS15 on 2/9 and 2/11 5 to 7pm. No equipment or experience needed!